Index > Mouth-Watering Meaty Treats > Country Fried Bacon? This is the Big One, Elizabeth! Country Fried Bacon? This is the Big One, Elizabeth! 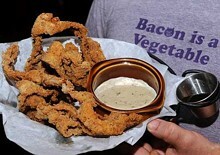 Risque Cafe on N. Clark in Chicago has created what is possibly the crowning bacon achievement, country-fried bacon. Raw bacon is dipped in a standard egg wash, dredged in peppered flour, deep fried in vegetable oil and served with a side of white gravy according to chef Andrew Niemeyer. Read more about the dish and the restaurant in the Chicago Sun Times.